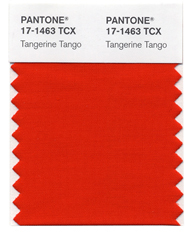 Pantone reveals Tangerine Tango - the 2012 Color of the Year! The whimsical and romantic pink that is PANTONE® 18-2120 Honeysuckle has officially passed the torch for Color of the Year to “a spirited reddish orange” aptly titled PANTONE® 17-1463 Tangerine Tango. Thanks to the nod from PANTONE, orange – a color often associated with happiness, energy, encouragement, and creativity – can now be found ruling the runways from Paris to Milan to New York, adorning the pages of interior design and fashion magazines, lining cosmetic counters in countless department stores, and gracing the walls and sofas of homes all over the world. PANTONE, LLC – an X-rite company (NASDAQ: XRIT) – is THE global authority on color and provider of professional color standards for the design industries. Tangerine Tango – their vivacious, enticing Color of the Year 2012 makes a great addition to homes in the form of bedspreads, accent pillows, tabletop accessories, artwork, and accent walls in rooms where you want to add a spicy punch of color. Orange plays well with stained woods, warm browns, bright whites, cool pinks, and lime greens. It’s a real attention-grabber, and – whether you wear it or decorate your home with it – is bound to get you noticed. This Highlight Home kitchen remodel showcases Benjamin Moore's earthy orange "Clay Pot". Highlight Homes is in the business of getting our clients’ homes noticed through our thoughtfully designed and well-executed home renovations. We’re huge fans of the color orange, and based one of our favorite kitchen remodels around Benjamin Moore’s “Clay Pot” – a beautiful earthy shade of orange. That particular remodel garnered the attention of Atlanta Home Improvement Magazine, and was featured in their December 2009 issue. Whether you want to find a creative way to add orange to your décor or just wish to bring positive change to your home in time for Spring, we invite you to contact Highlight Homes’ talented design-build team today by calling 678-873-9234, e-mailing info@highlighthomesga.com, or filling out our convenient online contact form. To receive news of our monthly specials and design tips/trends, we recommend you join our e-newsletter mailing list. Green Building Council of the Greater Atlanta Home Builder's Association hosts White House Energy, Environment, and Conservation Roundtable - and Highlight Homes was there! Regardless of your politics and whether you live in a red or blue state, the U.S. government has expressed an increasing concern centered around green construction, energy efficiency, and conservation – three subjects that just happen to be near and dear to the heart of Highlight Homes’ founder, Tony Pourhassan. Therefore, it goes without saying that Tony was more than a little flattered and honored to be invited to take place in last week’s White House Energy, Environment, and Conservation Roundtable hosted by the Green Building Council of the Greater Atlanta Home Builder’s Association. Tony – a proud member of the Green Building Council since 2011 – took his seat beside other prominent Atlanta builders, representatives from the General Services Administration (GSA) and the U.S. Department of Housing and Urban Development (HUD), Georgia Environmental Finance Authority, Atlanta Housing Authority, and local government officials to talk about the future of sustainability, clean energy, conservation, and green jobs in our country. Topics discussed during the January 31 meeting included incentives, tax credits, code enforcement, and programs designed to encourage sustainability, clean energy, conservation, and all that goes into building an “America that will last.” The insights gleaned from this meeting will be shared with the White House. While the meeting may have come to a close, Tony and his fellow council members were assured that this is just the beginning of the conversation. In the future, the White House’s Council on Environmental Quality (CEQ) will be contacting participants of the Roundtable to take part in conference calls and dialogues covering a wide range of topics pertaining to energy, the environment and conservation. To stay up-to-date on the latest Highlight Homes’ news, “like” us on Facebook, follow us on Twitter, read our blog, and/or sign up to receive our monthly e-newsletter, the Highlight Homes Herald. If you wish to discuss green construction of a Highlight Homes custom home or room addition, contact Tony and his team by phone at 678.873.9234, via e-mail at info@highlighthomesga.com, or through our convenient online contact form. To learn more about Tony and Highlight Homes, visit the Atlanta-based company website at www.highlighthomesga.com.